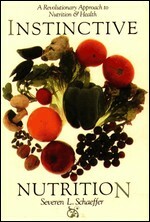 Severen Schaeffer, a member of the Paris School of Medicine in France, is the author of Instinctive Nutrition. In his book he explains how we have a built in instinct that allows us to select the foods that will promote our optimal health. Schaeffer explains that because instinctive nutrition reflects each person’s unique and always changing needs, it is a naturally pleasurable way to eat that does not involve any dieting in the usual sense. By selecting the foods that appeal to us at any given time and eating them until satisfaction is reached, ideal weight will be achieved, health and vitality will be renewed and chronic illness alleviated. Instinctive nutrition is based on the discovery that when a human being eats any food in its original state, the taste changes at a certain point from pleasant to unpleasant. This acts as a signal to the body that it has had enough and to stop eating that particular food. However this effect is only seen with foods that are not cooked, seasoned, or mixed with other foods. Schaeffer also explains that the method will only work for foods that are ‘natural’ for humans. This means that any food that is processed in any way including cooking will not allow the taste change to occur. He also says that cereal grains and dairy products can not be considered our natural foods because they are a recent introduction into our diet and we have not had time to genetically adapt to them. When instinctive nutrition is used to overcome chronic diseases only two meals are served daily; lunch at noon and dinner at 7pm. However, Schaeffer states that appetite is the best guide as long as the tendency to snack compulsively is avoided. If hunger is experienced in the morning, fresh fruit is recommended. At lunchtime dieters are advised to first gather a variety of different fruits and then to smell each one of them. Whichever fruit smells most appealing is the one to be eaten until a taste change is experienced. Then a second fruit may be selected and the process repeated. If enough fruit has been eaten to result in complete satiation of hunger then the dieter can stop eating. If still hungry dieters can repeat the process with nuts and following this honey may be eaten. For the evening meal the same process occurs but with different foods. The first food can be chosen from meat, eggs, seafood or sprouts. Only one protein food is to be eaten in this meal. Following this the process is repeated for vegetables, then fruits and honey if desired. Raw fruits and vegetables, raw meat and poultry, raw seafood, raw eggs, sprouts, raw nuts and seeds, coconut, honey. There are no specific recommendations for exercise. Instinctive Nutrition retails at $12.95. There will also be a high cost for groceries due to the need to have a wide variety of different foods available in large quantities. Many dieters have reported success with alleviation of chronic illness including arthritis, diabetes, and auto-immune diseases. Dieters eat only the foods that they instinctively enjoy. No need to prepare meals, which will make more time available for other activities. Removes the input of harmful compounds from processed foods and heated oils. Not practical to follow outside the clinical setting. There will potentially be a lot of wastage of the food that is not appealing. May be socially alienating as it will be extremely difficult to eat out and in social settings. Does not allow any cooked foods, seasonings, alcohol or caffeine. Requires a complete overhaul of dietary habits, which will be difficult to sustain without guidance and ongoing support. Raw meat, seafood and eggs may be contaminated with bacteria and carry a risk of food poisoning. Instinctive nutrition is an extreme approach to eating that will appeal to those with chronic health problems that have not improved through other methods. While many have reported success in the clinical setting it would be very difficult to follow this diet in the home environment due to the need to have access to a wide variety of different foods in large quantities. Interesting…and yes rather weird. But could be the good results are more the result of the Intermittent Fasting aspect built into this, which has profound proven health benefits. Thank you by the way for your very thorough list, wonderful site, and balanced reviews!